Freechoice: Experience an iconic canal cruise or enjoy a slice of quintessential Holland at Zaanse Schans, with its windmills and open-air conservation area. Freechoice: Take a stroll through Cologne and get up close to the filigree twin towers of the famous cathedral. Alternatively enjoy a taste experience lecture on board your Scenic Space-Ship. Whatever you choose it’s a great day to see and discover. Freechoice: Enjoy a walking tour of Regensburg or hop on board a local ferry and sail the Danube Gorge to Weltenburg Abbey, and sample beer from one of the oldest monastic breweries in the world. Freechoice: Experience Melk’s magnificent 18th century Benedictine Abbey on a guided tour. Alternatively, the more active can embark on an enjoyable guided bike ride along the river from Melk to one of the most enchanting villages in the region, Dürnstein – at your own pace, of course. Or visit a local winery for a guided tour and tasting of its fine wines. Discover grand palaces & castles on Europe’s most tempting waterways, the Rhine, Main & Danube on a luxurious 15 day river cruise from Amsterdam to Budapest. 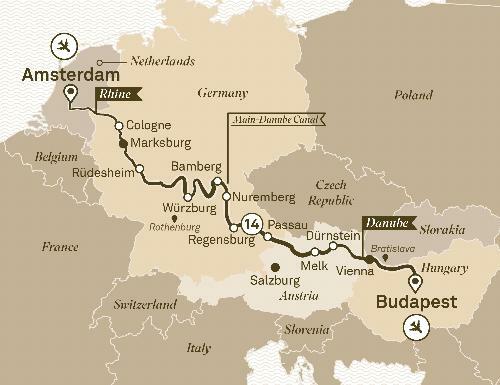 A region steeped in the history of ancient trade routes, today the rivers of the Rhine, Main and Danube meander through forested hillsides, idyllic vineyards and romantic towns. Restored castles still stand watch from their position atop dramatic hilltops, just as they did in the days of feudal knights and land barons. However, today the sites of ancient battles and medieval skirmishes have been replaced by a tranquil countryside with thriving towns and villages. Elsewhere, romantic ruins echo with a timeless beauty and Gothic spires rise out of the picturesque communities nestled along the river banks. This is a journey that will take you through the Europe of your imagination, full of wonder, recalling medieval jousts, cobbled streets and childhood fairytales while creating memories that will last a lifetime.